“The sluice has a problem and they have to replace the door. 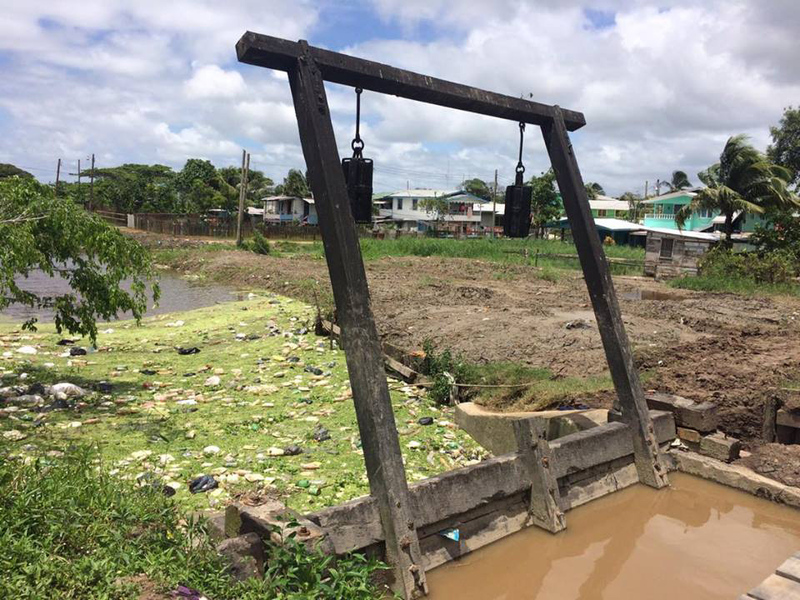 Now when they have to replace the door they tried to desilt the whole thing cause it needed desilting and they dig over that side but because of the high tide the slush rushing in back,” the sluice operator Ibrahim Shakur explained to Stabroek News yesterday. He said the sluice door could not be opened and flooding was affecting the community for the past three weeks. In addition to desilting the canal, there needs to be other systems in place to ensure the slush is removed so that when the door is lifted, it will not run back in, he said. In addition to the door not being able to open, the operator explained that the state of the drainage system contributes to the yards being flooded when the water builds up. He noted the construction of the new housing scheme. “They full up some of the trench so the water pile up and it gon flood the yard and it ain’t got nowhere to go cause the door ain’t opening,” he said. He added that the buildup of vegetation in the canals and waterways is also drastically affecting the water flow. Shakur further said that the chains used to operate the sluice are too small and would sometimes burst when attempting to open the sluice doors. “It impossible to open,” he said, pointing out that an excavator, which was propped up several feet away from the koker, was contracted to assist in removing and replacing the sluice door but has been unable to complete the task after several weeks. The man, who has been working at the sluice for 38 years, related that the problem is not new and has been occurring since 2013. He said he has advised the authorities to take better care of the sluices but they have not been heeding his words. “Two pounds of grease and a pint of oil can’t do nothing, look how at these things rusty and dry up. They does be hard to move when you got to open it too,” he said. Shakur said from what he has been hearing over the years, the budget that is usually passed has never been sufficient to maintain all the sluices. Further, he said, the entire drainage system in the area needs to be fixed as the area is flood prone, especially when it rains. “They don’t dig the backlands and all them places just clog up so the water ain’t got nowhere to go but raise up,” he asserted. The sluice operator also said the authorities should have desilted the canals during the dry season. “They had the whole dry season to do the digging and now it raining and they want to do it. Now the contractor hesitant to go places because he seh he ain’t want to turn over because the place mushy,” he said. Even though it has been three weeks since the problem was reported to the National Drainage and Irrigation Authority (NDIA), it is uncertain when it will be fixed. NDIA head Frederick Flatts told Stabroek News when contacted yesterday that they are aware of the problems and are in the process of addressing them but he would be unable to say when it would be completed. “I wish if I could say we will have it fixed by tomorrow or that it was already fixed but we have encountered some problems and that has been holding us back,” Flatts said. He said during the three weeks, the contractor encountered various problems that have hindered their progress. Meantime, residents complained of the flooding. “Well you can see that the yard still flood as they got water but I remember around two weeks or so time, the water just come out like that out of the blue and went away. Is not even raining yet and it flooding and me ain’t know exactly what going on with the koker, I hear it nah work,” a resident told Stabroek News yesterday. He expressed worry as he related that even though it has not been raining, his yard would be covered with water almost every afternoon. “What gon happen when it start to rain,” he questioned. He related that while the water has not reached inside his home, he had already propped up his furniture as he prepares for the worst. Another resident explained that since the area is flood prone, they are not surprised and were already prepared to deal with the random flooding. “Well we accustomed to this from the rain when it does rain but nothing ain’t damage cause we already ready. Most people in the area build up they yard or got things in place to deal with the flood, not when it does come heavy but the lil thing,” the person related. 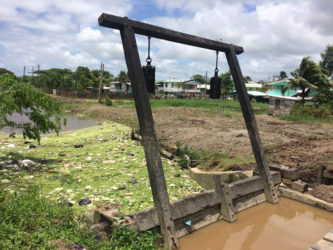 Stabroek News was told that residents did not suffer any serious damage due to the flooding but they are calling on the authorities to fix the problem as soon as possible.